If we really dropped illusions for what others can give us or deprive us of, we would become alert. The consequence of not doing this is terrifying and inescapable -- we lose our capacity to love. If you wish to love, you must learn to see again. And if you wish to see, you must learn to give up this drug. It's as simple as that. Give up your dependency. Tear away the tentacles of society that have enveloped and suffocated your being. You must drop them. Externally, everything will go on as before, but though you will continue to be in the world, you will no longer be of it. In your heart, you will now be free at last, if utterly alone. Your dependence on your drug will die. You don't have to go to the desert; you're right in the middle of people; you're enjoying them immensely. But they no longer have the power to make you happy or miserable. That's what aloneness means. In this solitude your dependence dies. The capacity to love is born. One no longer sees others as means of satisfying one's addiction. Only someone who has attempted this knows the terrors of the process. It's like inviting yourself to die. It's like asking the poor drug addict to give up the only happiness he has ever known. How to replace it with the taste of bread and fruit and the clean taste of the morning air, the sweetness of the water of the mountain stream? While he is struggling with his withdrawal symptoms and the emptiness he experiences within himself now that his drug is gone, nothing can fill the emptiness except his drug. Can you imagine a life in which you refuse to enjoy or take pleasure in a single word of appreciation or to rest your head on anyone's shoulder for support? Think of a life in which you depend on no one emotionally, so that no one has the power to make you happy or miserable anymore. You refuse to need any particular person or to be special to anyone or to call anyone your own. The birds of the air have their nests and the foxes their holes, but you will have nowhere to rest your head in your journey through life. If you ever get to this state, you will at last know what it means to see with a vision that is clear and unclouded by fear or desire. Every word there is measured. To see at last with a vision that is clear and unclouded by fear or desire. You will then know what it means to love. Seed questions for reflection: What do you understand by the drug of dependency? How do we reconcile recognizing the interdependence of the universe with being drugged by dependency? 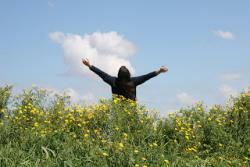 Can you share a personal experience of a time that you let go of the drug and felt freedom? I feel some discomfort with Anthony's article. I think it is in his use of the concept of aloneness, for I believe that at our deepest essence we are one with all that is and therefore never alone. Even on the level of this human existence we are interdependent to the extent of never being alone. But this does not mean we must give up our ability, our responsibility to choose our response to whatever we encounter in life based on who we are at our core. In relinquishing our dependence on others to act toward us in ways that we define as loving, in choosing to act in ways that authentically reflect who we truly are, to live with integrity rather than trying to buy or force others to give us the love we want, we set ourselves free. We can then take responsibility for creating all the love that we need. The heart does not know the difference between receiving love from others and giving love to others. It is the flow of love that matters. When we live with love, we will have all the love that we could ever hope for. I REALLY LEARNT ALOT LOT OF THINGS ! it helps me to change my attitude. At the last Wed Circle meeting at Harshidaben and Dineshbhai's house, subject of attachment was discussed by some and Dineshbhai mentioned that he worries when some people do not send RSVP. He wondered if that is good thing. Here is my take on attachment. I think many times we misinterpret love as attachment. Love for your family, friends, all beings (human and non-human) is a good thing. When I think of attachment, I think of attachment for material and worldly things - wealth and other "signs" of prosperity. Even those are not really bad. What is bad is what we do or do not do with what we have. Take lessons from Bill and Melinda Gates, Warren Buffet, the . Kennedys, the Rockefellers and many more philanthropic people. So, let us all enjoy what we have, share as much as we can and enjoy. Thank you for your words of wisdom and inspiration. A better path to love accept that both loving and being loved necessarily includes pain, sadness, and even misery at times—and then to persevere and even thrive right alongside those difficult emotions. To be loved and to loved are the greatest gifts of our journey here on earth. We must embrace the entire scope of incarnate existence. We are interdependent. To live fully is to love and be loved and suffer, to desire and reject, and to laugh and to cry. And to do each with gusto and presence and to continue on every day, knowing that ultimately, we will all be okay. That is a life well lived. That is awakening. Now I understand why my world has been falling apart!. The Universe is preparing me for Love! After getting past feelings of anger that I have had for many years I am now slowly getting in touch with sadness. Its very deep and I can only feel little bits at a time. The sadness is me being alone. I do understand that I have been dependent on the "outside" since I was a baby, beginning with my mom. That has transmuted to institutionalized Jewish religion which I am now in a evolution/revolution stage until I find my path being connected to God and myself. I am hoping that my path will be the one of love! Thank you so much, I feel wonderful that now I can have a community of "lovers:"
To the degree I have faced my emptiness I have, to some degree, freed myself from a certain psychological dependence. To the degree I have freed myself from appreciation or depreciation coming from others I feel more alert and able to face and enjoy life just as it is. But this relative freedom, I can sense in myself. is not the whole deal. Because, up to that point, where does it relate to love? And is love the feeling of all-oneness (alone/all one) that comes with complete inward freedom and does one consistently feels it in one's daily experience? If not, then, I understand the author to say one has still to quit the drug. I can easily fool myself into thinking I am free. I have to test that against the reality of my experience. I love so deeply, and appreciate the interdependency of this world. How could anyone ever believe we are alone? And, true freedom is the ability to feel fully and truely see the mistaken identities of addiction (hatred or desire or the manifestation of the these two extremes) in a way that allows us to be fully engaged in this ever changing world without forgetting to acknowledge the mistaken identities that rob us from our true selves. David :Doane your reflection says it all, to take away your inner divine self, because you need to be right for everybody else. Fear is the word! of not being the the best, or not knowing it all. Fear creates all human failings.Drugs temporally shines a light. Then as the devil does, drops you deeper into that bucket of fear. The word love comes to light so often in all situations, just turn around to that permanent light it never goes out. Choose that divine soul from within help it to survive. Believe what you are. You were born special only you can help your self to remain that way, come what may! My understanding of the drug of dependency is defining me by what I think the other wants or by what I think will get me what I want. It means my saying or doing something based on how I think the other will respond. It is manipulating myself and my expression of myself in order to attain a particular result or goal. It's being what we call a politician. To paraphrase Martin Buber, he said that if I am I because you are you, and you are you because I am I, then I am not I and you are not you; but if I am I because I am I and you are you because you are you, then I really am I and you really are you, and we can meet. I being I because you are being you is the drug of dependency. I being I because I am I is independence and freedom, and often takes much courage to live out. There is no need to reconcile the interdependence of the universe with being drugged by dependence. They are different ways of being. Interdependence of the universe means each form in the universe is independent and free in its being and is affecting and being affected by every other form, but it is not how it is because of the other. The sun shines and I sweat. The sun is not shining to make me sweat nor is it dependent on my sweating. I sweat not because the sun is hot but because I am how I am. Or, I may say I am bombing another country because of how they are, which is not true and is the twisted thinking of the drug of dependence. The truth is that if I bomb another country it is because of how I am, it's my independent action and responsibility. I let go of the drug of dependency when I am true to myself, accepting and expressing my truth as I interact with others and am affected by others. "Personal peace" (freedom from anxiety and panic) I found (in TIME) came directly from Heaven. In letting go of my "religion" (figuratively) and heightening my awareness of Jesus (everywhere . . . In all things and In all people), I eventually experienced "the freedom" that only God/ Jesus/ Holy Spirit can give. Jesus,I have learned in my time spent with Him, is Fluffy and Unconventional, too! In Him, I am free! FYI: I continue to worship God in a Catholic Church. Eucharist, I am completely "dependent" on. I never wish to be "free" of His Presence in it. All of Jesus in all of me. amen. This is such a powerful piece, thank you for sharing it. It explains the concept of simultaneously being alone and loving in plain, clear language. A few sentences really stood out to me, including this one: "Think of a life in which you depend on no one emotionally, so that no one has the power to make you happy or miserable anymore." It reminds me of my 62-year old dad, who is disabled, and is entering his old age as a very calm and gentle person whose own inner feelings and thoughts are not affected by others. No matter what is happening around him, he is always content. He is recognizing that things come and go, and it is better not to be attached. Just keep going, he always tells me. Being disabled can be isolating for him much of the time, yet as his body is deteriorating, his mind is becoming stronger, and I look to him as an inspiration of being happy and loving at all times. He has told me that he desires nothing, and it is evident in the simple way that he accepts whatever is offered to him and gives everything that he has to others. Although my dad and me have had many positive and negative experiences over the years, witnessing him these days is a humble lesson in developing clarity of vision and a real capacity to love. Breath practices especially Pranayama from Raja Yoga for managing the prana in the body-mind is an intervention that helps allay the effects of drug addiction. Research states that Hatha Yoga helps remove stress, but does not bring sound sleep. On the other hand Pranayama meditation brought sound sleep to PTSD patients.